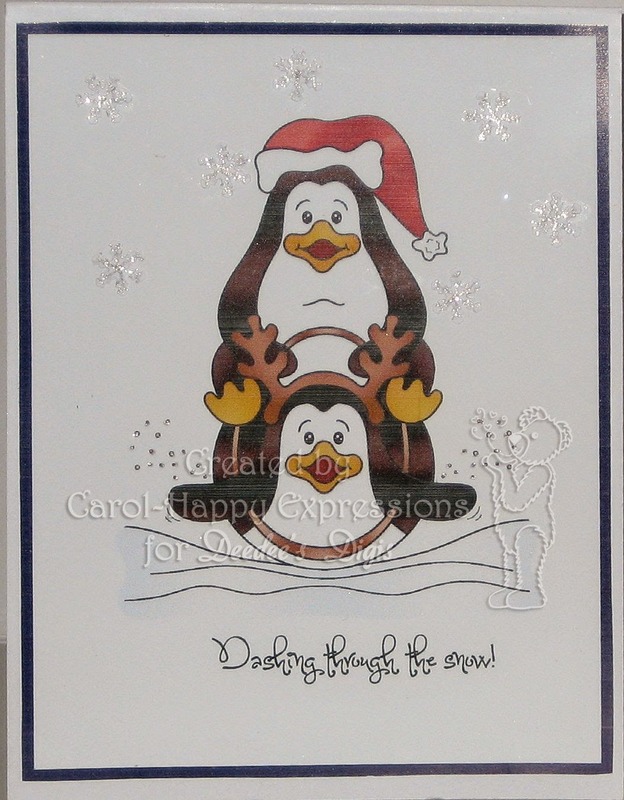 I have a new card to share with you from Deedee's Digis. You will find this digi here. These didis are fun to use. You will get the pre colored image as well as the line drawing. You can find the Challenge blog here. You can purchase this month's featured set for just $1.25 in our shop. If you participated in last month's challenge, you should have already received this set in your email. (If you participated but didn't receive the set, please contact us -- sometimes things do go wrong with email). The card base is neenah cs folded the long way. This image is pre colored onto neenah cs and adding the sentiment. Don't you just love the font on this sentiment. I then added the navy blue border around the image before printing it all. One it was printed I took my recollections small snowflake punch and punched quite a few and scattered them around the card. I can not have a Christmas card without some glitter. I used the sukura glitter pen and added it to all of the snowflakes. I hope you will join in on our challege and try out some of the wonderful images. Thank you all for stopping by, happy crafting and have a fabulous and blessed day! Labels: Christmas, deedee digi designs, Neenah solar white, recollection punches, sukura glitter pen. Just made me laugh out loud. So cute. Very CAS - thanks for sharing with us at Crafting with Dragonflies. Love it! But can you explain how you printed it with the blue border? I'm not understanding that and I'd love to replicate what you've created. Thanks. I will try and upload a video or screen shot on how to recreate how I did the border. Thank you all for your sweet comments.